DIY Hardware - Order Online! 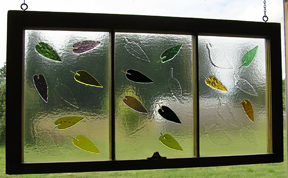 Decorative windows can add life and personality to any room! This particular project was installed inside the existing bathroom window casing. 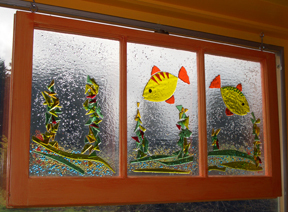 These whimsical windows use recycled window frames! Just hang and enjoy! 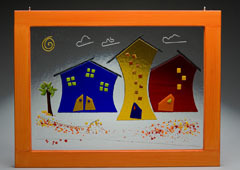 With the old glass removed, new fused glass panes are created using techniques to add dimension to both the front and the back of the glass. Look closely above, and you will see the swirl clouds that are 'embossed' into the back of the glass behind the houses and the crushed glass 'bubbles' added to the front of the fish panes. In addition to adding depth to the pieces, the three-dimensional aspect invites the sense of touch and the pieces change continually as the light in the room changes. 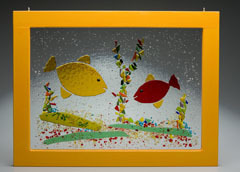 Provides privacy without blocking light... or use as a room divider or work of art on the wall. 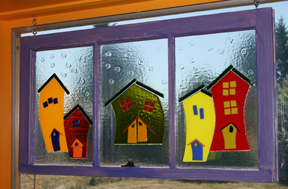 These windows are sure to brighten any room or space. Similar in nature to their larger recycled counterparts, the windows above are built with handmade window frames and fit nearly any window space. Copyright Confusion Art Studio. All rights reserved. All works depicted on this site are protected by copyright and should not be reproduced and/or copied without the express permission of the artist, Donna LaPlante.